It wasn't much to look at: concrete floors, yellow walls, inexplicable disco music. But the corn tortillas were a miracle of softness and flavor. 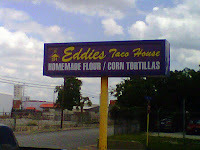 Now nothing else will do; no fancy restaurant with tablecloths and a specialty chef trained overseas, no over-hyped review can tempt them from the simple tasty charms of Eddie's Taco House. Note: My husband and I love to go here when we are in San Antonio. 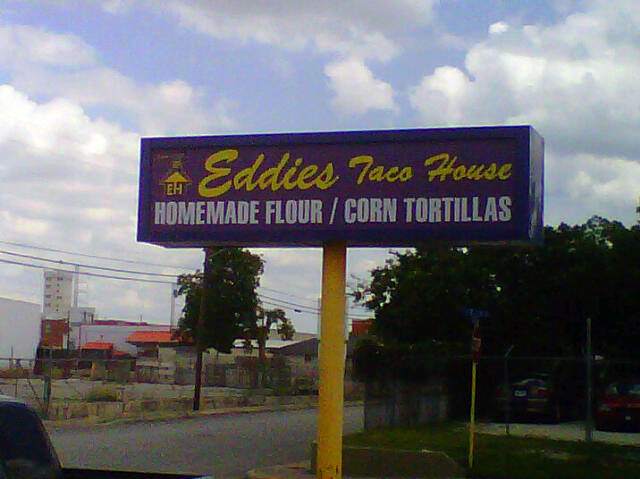 When I first saw one of their corn tortillas, I thought for sure it was flour. OMG, so soft and tasty, unlike those cardboard ones you get at the store! Now I always order some to bring home with me. Damn it, now I want a taco too! I've long maintained that a good hole-in-the-wall is the way to go. Those little places are always the best! I would gladly settle for some decent flour tortillas that I didn't make myself. All the ones in the stores here have weird tasting chemicals in them. Hahaha - I don't care how good the tacos are, if it's disco music I'll have to do it as a carryout!